The Newspaper theme comes with fiftysix unique designs for your website. Our demos were carefully tested so you don’t have to create everything from scratch, just choose a template, a click and you’re done. You can preview the desired demo before installing it. 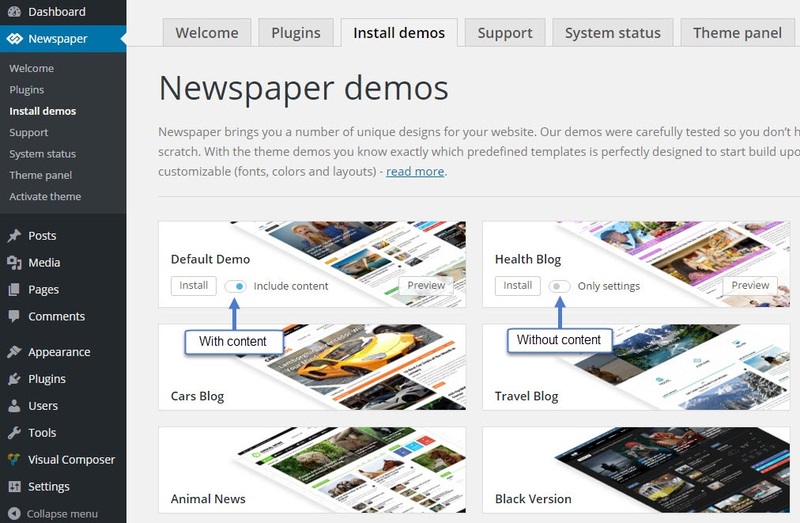 Go to Newspaper > Install demos section. There you will find all our available demos. Choose the one you like and click on the Preview button to Preview a demo or Install button to install a demo. You can also use the quick install panel, but note that it will automatically install the demo content. You can install a demo importing all settings and content or just the settings. 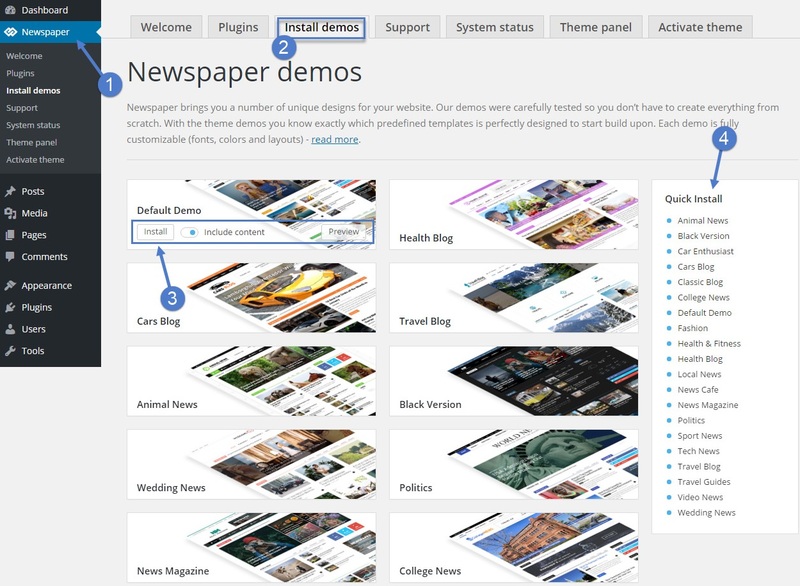 Go to Newspaper > Install demos section. Choose the one you like and turn to ON or OFF the Include content setting. When this option is ON, the demo will also install content (posts, categories, menus, etc.). When this option is OFF, the demo will just include the predefined settings. ***Important notice: If you choose to install a demo with content, do not edit the content and use it as your site content, because the demo content will get removed when uninstalling or switching demos. If you decide to change the demo or uninstall it, the import system will make sure that your website is clean: no additional sidebars, menus or content. It will leave your website just like it was before you installed the demo. 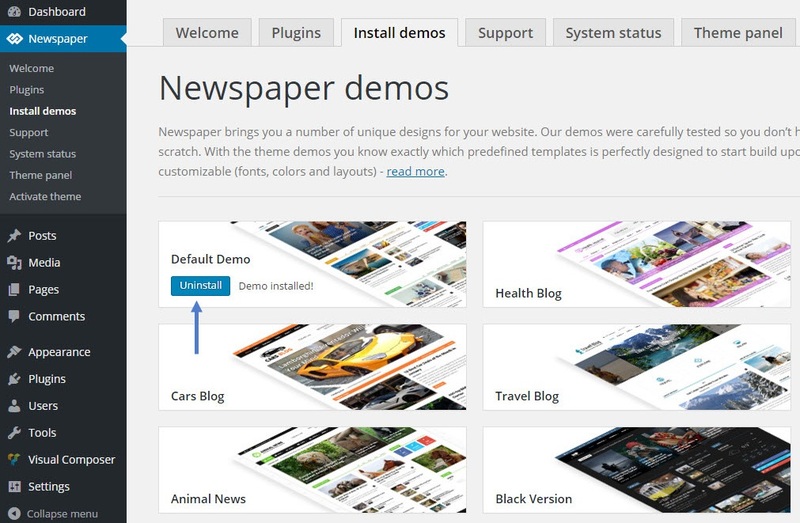 To uninstall a demo go to Newspaper > Install demos section. Click on the Uninstall button.